The Chester Archaeological Society has been publishing a journal since 1857. It contains reports on local excavations, discussion articles by distinguished scholars and conference details. Recent issues are available in the Local History section of Chester library and at other major libraries across Cheshire. The latest edition contains some exciting reports on recent archaeological discoveries within Chester and further afield. The excavation carried out beneath what is now the award winning Storyhouse confirmed the presence of badly damaged but important remains of Roman buildings, a road and drains. 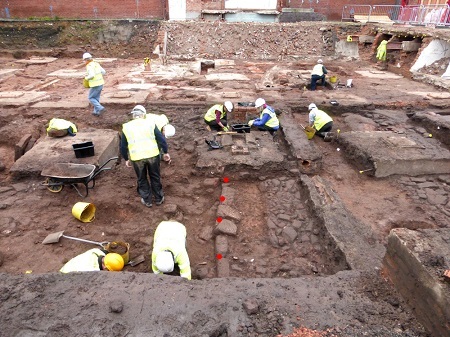 In addition to the Roman finds, clay pipes, glass and a complete seventeenth-century chamber pot gave a fascinating insight into how this part of Chester has changed over the centuries. During the works directed by Leigh Dodd of Earthworks Archaeological Services, local people had the chance to join a city centre 'dig' as well as to learn about the excavation during site visits. Archaeological remains had been found on the site of the Odeon in 1936. Any remains at the neighbouring Commerce House were believed to have been totally destroyed by a deep basement. However, trial excavation showed this was wrong, and Cheshire West and Chester Council staff worked with Historic England and the main construction contractors from Kier to minimise further destruction when the new theatre was built on its site. The full report on the work will allow experts to compare the remains with those found in other Roman fortresses and come up with ideas about the function of the buildings, which is not yet fully understood. The Journal contains a report on recent discoveries during repairs to the city walls adjacent to the Northgate, where fragments of the west tower of the Roman fortress’s north gate were recorded. As elsewhere on the walls, massive blocks of sandstone were used to give a monumental impression. An article by the well-known local archaeologist Dr Rob Philpott looks at the results of around 20 formal metal-detector surveys that have been carried out across Cheshire in advance of development. These projects have seen experienced local metal detectorists working closely with professional archaeologists to identify sites for further examination as well as recovering objects dropped or discarded over many centuries. Dr Philpott has concluded that this work has been of real value in providing evidence, for example, of a Roman farmstead and the recovery of a wide range of personal items, coins, and household objects. Importantly, these projects have allowed local people to make a real contribution to advancing the knowledge and understanding of Cheshire’s past. Also reported on is a 13th- to 14th-century settlement on the site of the former Saighton Army Camp, adjacent to the medieval moated site amid the remains of curved strip fields. Excavations underway at Storyhouse before construction of the extension showing the remains of Roman buildings, a road, and drains.